It rained all day long on January 24, but then the sun emerged at sunset, as if on cue. All were rewarded with a perfect 180-degree rainbow, unusually bright thanks to a backdrop of furious storm clouds heading out to sea. 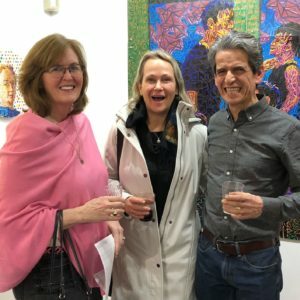 It was an auspicious start to the opening reception for the exhibition “Up and Down: Global Visions, The World of Nestor Madalengoitia and Tova Snyder,” at The Rye Arts Center. 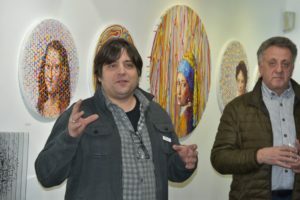 Curator Adam Levi had the idea to bring these two artists together, realizing that each had long-standing connections to the community and to the Rye Arts Center. Though they had never met, both Tova and Nestor have participated in the Center’s biennial <plein-air> paint-out known as “Painters on Location.” Their styles are very different, yet both artists tend toward colorful street scenes, buildings and portraits from around the globe. As part of the prestigious MTA’s Arts for Transit program, she created the stained-glass installation called <Railways and Rooftops> for Harrison’s Metro-North station. In 2017, Tova completed a six-story mural on Webster Avenue in the Bronx, in partnership with NYC’s Mural Arts Project. Nestor was born in Lima, Peru, and lives in Poughkeepsie. He completed his studies at Catholic University in Lima and at SUNY/New Paltz. Like Tova, Nestor is interested in engaging with the wider world through his art. He, too, is a seasoned muralist. After visiting his Poughkeepsie studio several years ago, we hopped in his car to drive around the city. His murals enliven the walls of many streets, which often depict inspiring historical figures from around the world. Like many artists, he seems to draw energy from engaging and sharing his art with others. In 2016, he created an extraordinary ink painting of Purchase Street (with a view of the former Smoke Shop) which members of the community were invited to help him complete. It was so popular that he was commissioned to create a second version in oil. Nestor is constantly pushing himself to grow as an artist, experimenting with his brushstrokes, moving fluidly from paper to canvas and even sculpture. Several years ago, he developed a system of deconstructing his painted surfaces, reducing them to pixels of color, often folding in text (Spanish and English) or repeating a tiny motif over and over again, to great effect. A self-portrait in the exhibit appears to contain ancient, pre-Columbian motifs. In addition to their landscapes, both artists have painted some exquisite portraits. 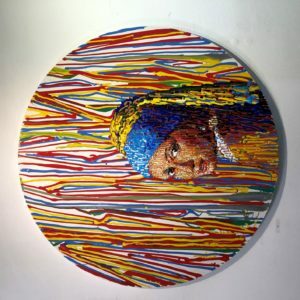 Especially pleasing are Nestor’s circular canvases, five very contemporary takes on classical female portraits by the Old Masters. Tova’s series of tiny “Faces of Bahia”, completed in Brazil, is captivating; the gaze within each portrait invites you to move closer. One of Tova’s most recent works is an aerial view of Berlin’s rooftops. The palette reflects the cooler light typical of a Northern city. She caught this unique view by ascending Berlin’s famed television tower, smack in the center of the city. Compare this work to her aerial view of Harrison or a village in Italy; you will observe that the colors shift accordingly. Here are two artists who are looking more closely at the world than the rest of us. They look up and down, absorbing their surroundings — the cacophony and colors, shapes and scenery — and then translate what they see, with a paintbrush and incredible skill. And collectors should take note: works range in price from $250 to just under $5,000. 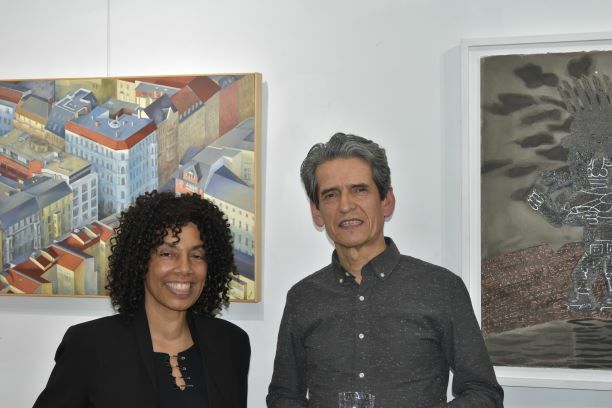 “Up and Down: Global Visions, The World of Nestor Madalengoitia and Tova Snyder” is on view at the Rye Arts Center through March 2.